Calling all Shoe Lovers #Giveaway !! I am the first to admit i am a huge shoe lover. I have rows and rows of shoes. They are stuffed under my bed, under the stairs and they line the wall of my bedroom. And yet i can never have enough shoes. There is always more room in my shoe loving heart for another perfect pair. Shoes just make me happy, they take an outfit from ok to wow in a second. So when the beautiful people at Bells Shoes allowed me to pick a pair, well it took me about 3 days to choose. Yup Mrs Indecisive here could not pick just one pair( i know, jeez Rachel, what a chore 😉 After scouring the site profusely, I ended up going for a beautiful new season pair from Clarks. You see Bells Shoes sell some of the most well known brands. I was so so tempted to get a pair of this summers favorited sandal the Birkenstock, but approaching autumn i went with a pair i would be able to wear a lot over the next few months. Take a peek here here! Dark forest green suede with black embellishment and black heels.. beautiful! Ps these also have inner cushioning making them so so soft and pillow like for your feet.. oh yes. My feet deserve this luxury! It makes wearing high heels that much more comfy and pleasurable. Thank you cushioning!! They also have the high scalloped edge which i am absolutely loving right now. Its such a great detail and adds such a lovely difference to the average court shoe shape! So how does a free pair of shoes sound? Good yes? Well the lovely people at Bells shoes are giving away £50 towards any shoe on their website! All you need to do is enter below! Good luck! And here’s to fabulous shoes! Cheers all! Running for 1 week starting today 10th sept, entries will be verified and open internationally! Pretty shoes! I'd love the Clark's Coolest Fruit Black Leather Trouser Shoe, the wavy lines are simple but interesting. 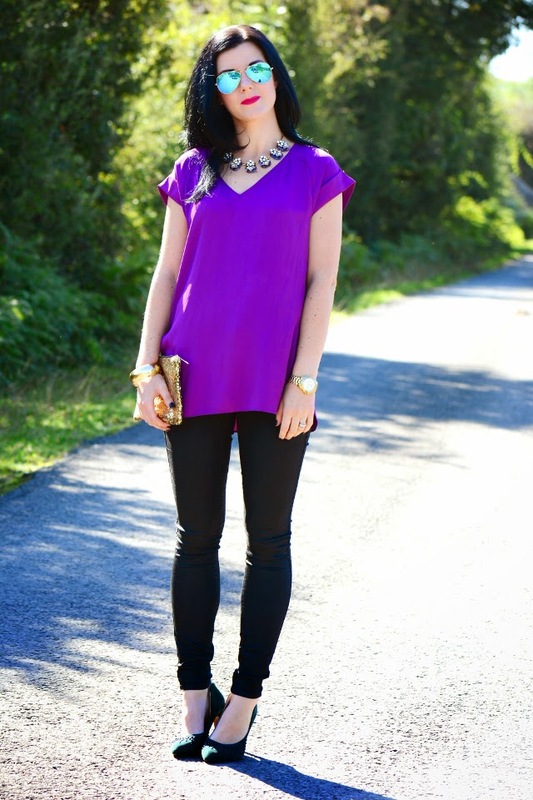 I love this outfit, the jewel purple looks amazing on you and those shoes are the perfect combination. I love shoes too, amazing giveaway! I'd love the Clarks Moonlit Cool Black Leather Booties! That color looks amazing on you! I'd add some money and get these: http://www.bellsshoes.co.uk/womens-c2/boots-c6/hispanitas-nerja-40099-bordo-ladies-shoe-boot-p6282 They're fab! 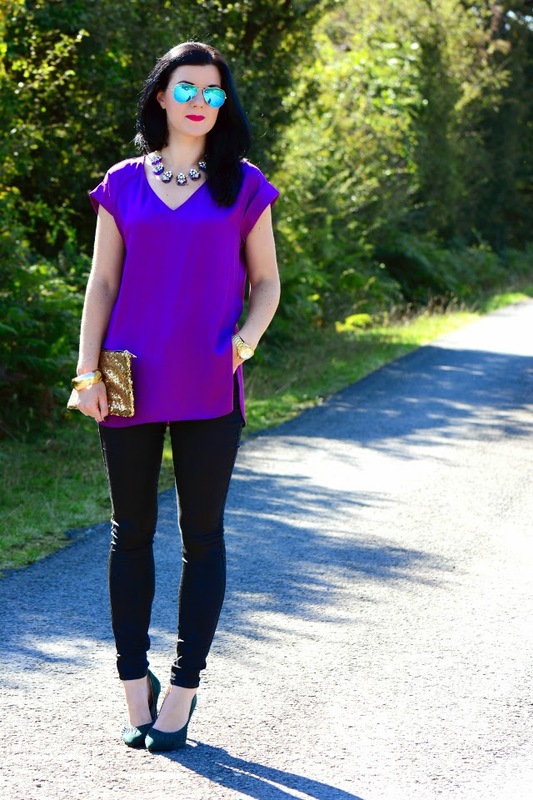 What a gorgeous bright purple top! Love it! I'd put it towards the Hispanitas Seville Ankle Boots, I'm hunting a pair of oxblood or wine colored booties and these ones are so unique. Love them. I would love to get the Clarks Likeable Me Black Leather Knee High Boots! Ahh I want this whole outfit–that top is fabulous and the shoes, amazing!! Those are gorgeous!! I wish I could wear heels, but i am easing into kitten heels. Love the black heel and the green rich shoes. 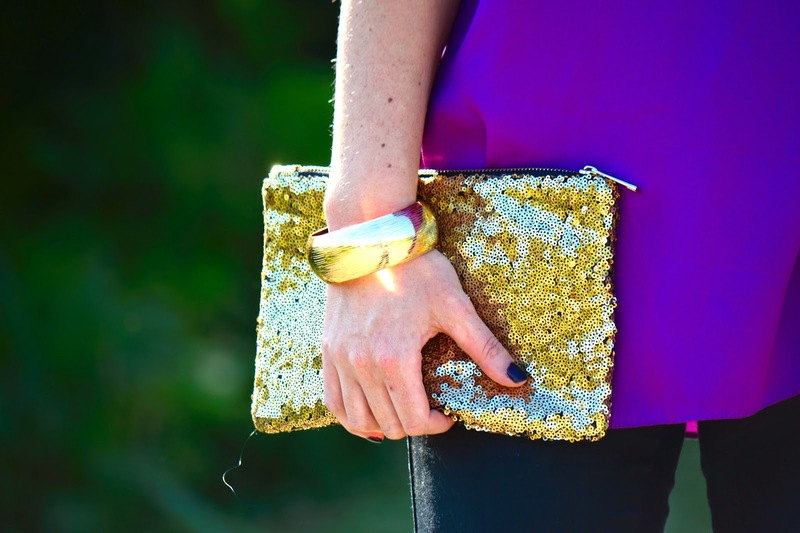 Paired with another jewel tone with the purple top, perfecto! Gorgeous! I love that top — the color is so pretty! I love the color of your top! It look so pretty on you!! Such an unusual colour! plus you describe their comfy feel so well! Your whole outfit is stunning, the colour of your top is perfect for you. I love your outfit! And a lady can never have too many shoes! Ur look great, love the Color of ur t-shirt! Oh gosh, bottle green is such a winner in my book. I love these. I love the Clarks Orinoco Jive Brown Leather Mid Calf Biker Boot! Wow! 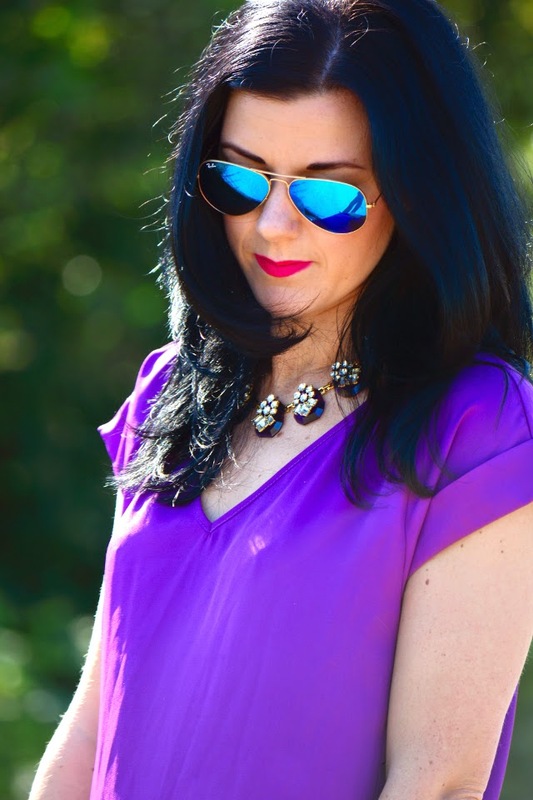 That purple is so vibrant on you, and I love the lipstick! 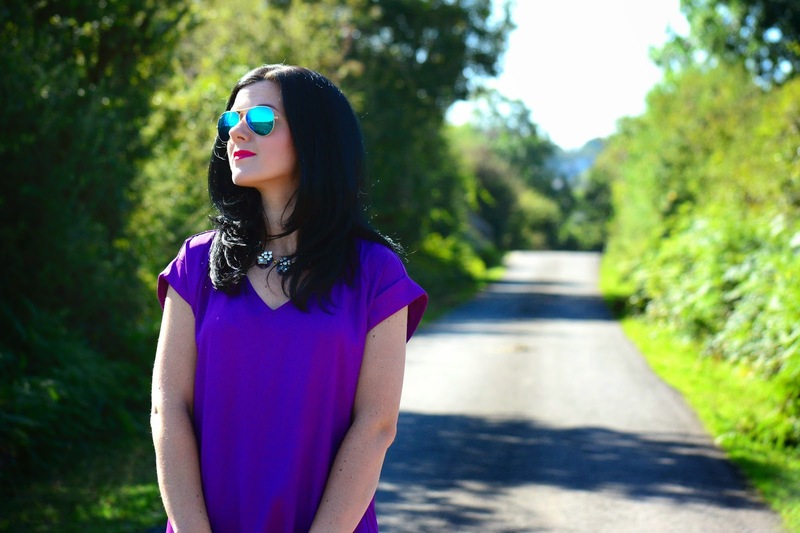 Thank you for linking up with Beautiful You! I would buy these boots! I love them! …. This color is stunning on you! Seriously! Thanks for linking up with me!